This page is just an introduction to Colonial because their background is not well documented, and the Company's duration even less so. It seems they may have been late to the market with their first venture into lighting. Just as with some of their peer companies, there is some indication that they too made stained glass windows before venturing into lighting. 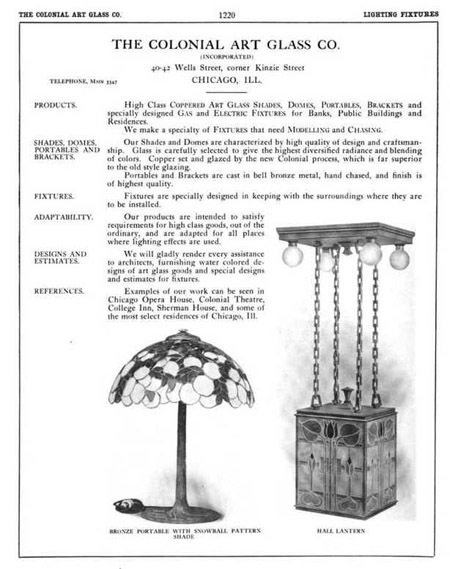 One year after the company exhibited their impressive lineup at The Electrical Show in Chicago during January of 1908, their only catalog (as of this writing) appeared. One advertisement (shown below) placed in Sweets Architectural Catalog during 1907 has also been found, but nothing further. 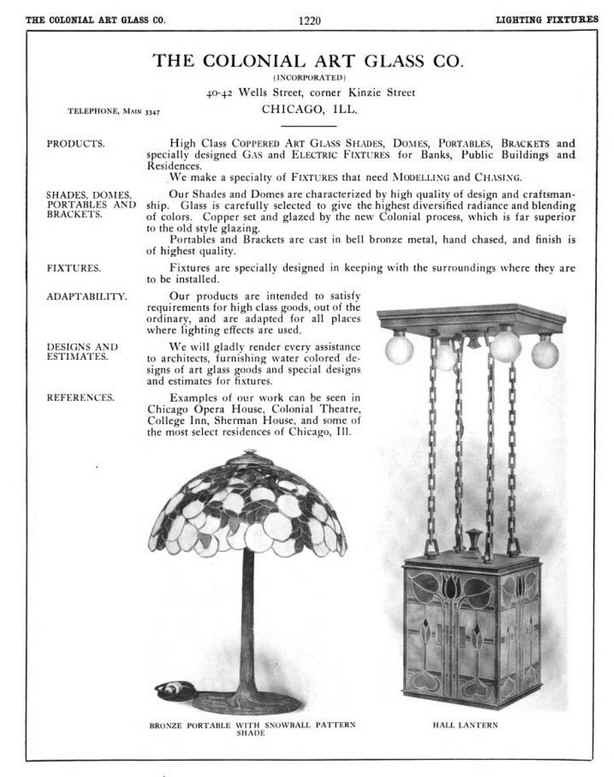 They were listed and represented among other well known leaded lamp makers at The Electric Shop in Chicago which opened in 1909 and may have initiated the need for their catalog. The very large range may have required a modest number of craftspeople to make this happen. 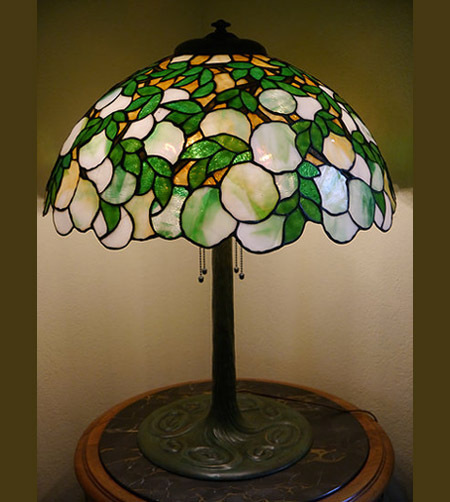 However they entered the leaded lamp market late where demand for their relatively expensive high end models was staring a decline. From the few mentions of the company in newspapers and other journals, only the first 4 of the the following names are listed, and all in attendance at The Electrical Show. They are C. Eugene Parkhurst, an E. C. Gmelin, R.F Warner and a B.P. George. In the press at the time of the exhibition Parkhurst is listed as the Chief Designer at Colonial. 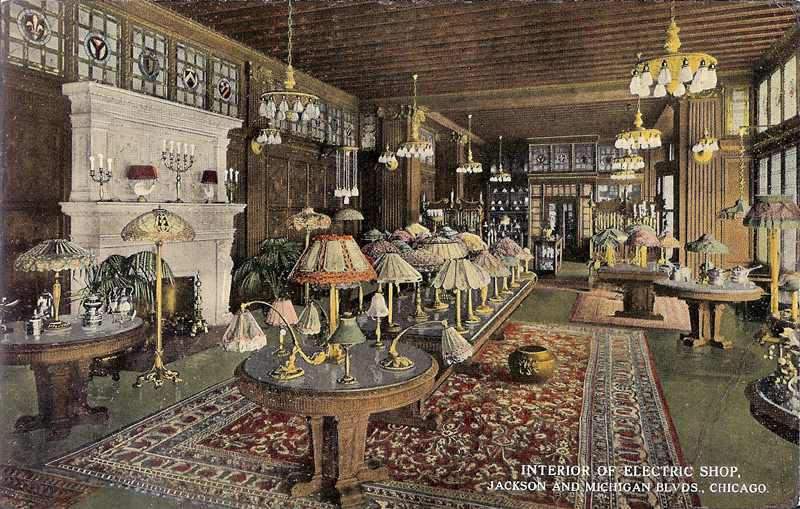 At some point after, he is shown in Illuminating Engineering Society Volume 13, No5, July 20th 1918 as being affiliated with The Gorham Company as designer of lighting fixtures and archtectural metal work. This same document shows Parkhurst as a former student or instructor of the Art Institute of Chicago. 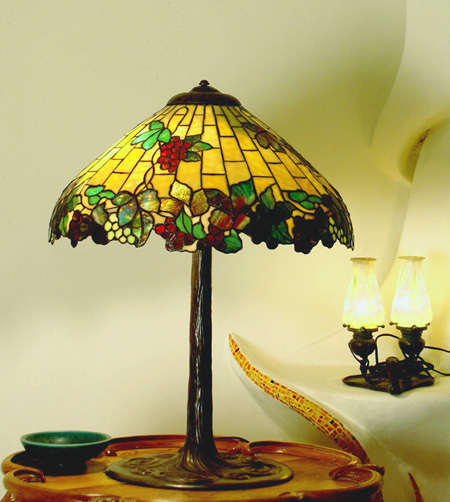 Three items are credited to him, including 2 lighting fixtures in the Italian Renaissance style. Born in 1863 in New Hampshire, married to Lydia Harland in 1895. He was Treasurer at Colonial, and in 1920 appears in the census as the Treasurer of a Glass Company. Born in 1873 in Wisconsin, married to Ada. In 1893 Milwaukee directory shows that he is a Glazier. By 1910, the census simply shows him as a manufacturer of art glass shades, but later records show him as the President of Colonial Art Glass. In 1915, he is listed as President of Imperial Glass and Electric with a business address of 407 Wells Street. Colonial workshops were at 40-42 Wells. By 1920 he appear4s in the census as a Glass Sign Manufacturer. With the appearance of a Colonial catalog and trade advertisement, we are beginning to recognize some of their leaded shades and examples of two models, the Grape (341) and the Hydrangea (230) are highlighted here. 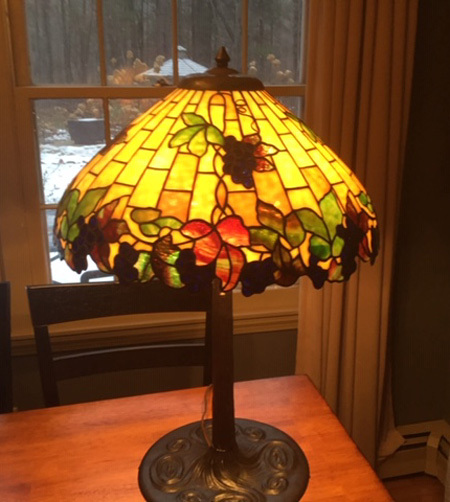 However, it is likely that many of the smaller shades are more numerous than their leaded output and remain un attributed in auctions and sales. From the existing leaded examples, both appear to be finely made. Click the images to get to their detail pages. © Byron Vreeland, 2004, All Rights Reserved. © A Collector, 2018, All Rights Reserved. © Antiquarian Gallery, 2018 All Rights Reserved. © Howard Booher, 2015 All Rights Reserved.